Personalized Cotton Canvas Tote Bags Customized in Bulk. Promotional, Inexpensive. Lowest cost in USA and Canada. High Quality, Premium Heavyweght Cotton Canvas. Natural, Black, Dark Green, Navy. Bulk tote bags made of premium heavyweight cotton canvas. We have the Budget Prices in the USA and Canada for personalized cotton canvas tote bags. Our wholesale custom imprinted canvas tote bags are available in 3 styles with different sizes or canvas thickness (see photos and descriptions below). The canvas bags are currently on sale at 79% of the regular prices (see the discounted prices in the Price Table below). 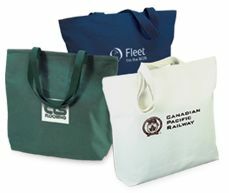 Our bulk tote bags may be also embroidered: contact us. Unit prices below include your 1-color imprint. Add the amount shown for each extra imprint color, per side. You may order any quantity above the minimum. Setup Charge: $50.00 per color; $25.00 on re-orders. Production Time: 7 days after artwork approval; 3-Day Rush production is available: add $0.50 per heavy cotton tote. B1E-HT3226 Features: 15" W x 15" H x 4" D, Heavy 12 oz. Cotton Canvas Tote Bags, Stylish 2 Tone Design, with 18" long handles. Max. Imprint Area: 6" W x 4" H. COLORS: Natural with Navy, Black, Forest Green, Pink, Red, Royal Blue or Purple handles and bottoms. See colors and more details here: heavy cotton canvas tote Production Time: 7 days after art approval. Rush Production is available: contact us. Unit prices below include your 1-color imprint, or they are for blank (not custom imprinted) tote bags. Add the amount shown for each extra imprint color, per side. You may order any quantity above the minimum. Production Time: 7 days after artwork approval; 3-Day Rush production is available: add $0.50 per cotton tote. Please multiply all the US prices above by 1.30 to get pricing in CAD$'s. B1F-HT3234 Features: 14" W x 12" H x 6" D, Deluxe, Ultra Heavy, 14 Oz. 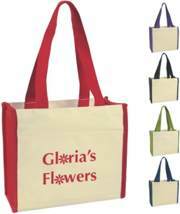 Cotton Canvas, 2 Tone Trendy Tote, with 27" long Handles and Outside Pocket. COLORS: Natural Beige/Navy Blue Trim, Natural Beige/Red Trim, Natural Beige/Black Trim, Natural Beige/Purple Trim, Natural Beige/Lime Green Trim: see photo. IMPRINT AREA: 9" W x 5" H. Production Time: 7 days after art approval. Rush Production is available: contact us.